Welcome to Gutter Clean Dorset. We are a family run Domestic and Commercial gutter cleaning company based in Christchurch, Dorset. If you’re looking for gutter cleaning and repairs you’ve come to the right place. We pride ourselves on being traditional gutter cleaners. We use ladders only to clear and maintain your gutters. All our work is external so we don’t need to go inside your property. Please see our gutter cleaning page for more information. We cover the following areas in Dorset – Christchurch, Highcliffe, Southbourne, Bournemouth, Poole, Blandford forum, Verwood, Wimborne and Wareham. Areas we cover in Hampshire – Bransgore and surrounding villages, Ringwood, Fordingbridge, New Milton, Lymington, Lyndhurst and Brockenhurst. Husband and Wife team James and Sharon established Completely Cleaned in 2012. After working as a Window and Gutter cleaner, James decided to take the plunge and start his own company. All jobs are undertaken by James, with no sub-contractors therefore ensuring a professional and reliable service every time. 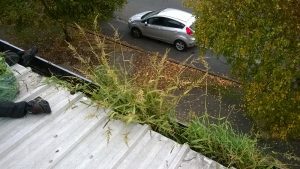 James has over 15 years experience in the cleaning and maintenance of gutters. Sharon has over 10 years experience in managerial and administrative roles therefore customer service is of the utmost importance. Together we offer an outstanding service to all of our customers. We have thousands of happy customers all over Dorset & Hampshire, but don’t take our word for it. See what some of them had to say about us below.